Home Dog Care Allergy Meds For Dogs: When Does Your Dog Need Them? Suddenly, out of nowhere you start to notice your dog is scratching its ears, or gnawing at its paws non-stop. You give your dog a check for fleas, and seeing none, you start to suspect that it could be allergies. It's important to know about allergy meds for dogs and whether or not your dog needs them, as not all allergic reactions require medication. Many dogs have symptoms that seem to develop seasonally, just like humans, and can be allergic to many of the same outdoor allergens. There are many available allergy medication options available for dogs, but how do you know if your dog has allergies? Making an appointment with your family veterinarian is the best way to get started in determining if your dog has allergies. Once determined, an array of allergy meds for dogs will be offered as options. Your vet will help you choose the one that best suits your dogs needs. ALSO READ: Ask A Vet – Does Hypoallergenic Dog Food Really Work? when does my dog need them? Your dog may be showing other unusual symptoms that may have you suspecting that your dog could be seriously ill but may actually be symptoms of allergies. Allergies can cause an array of physical symptoms from itchiness and ear infections to upset stomach and itchy red eyes. You may notice a sudden disinterest in its food, or vomiting and diarrhea. Changing foods may only seem to make the problem worse or you may notice that the change made a new problem begin, like hair loss. The overactive immune system is the primary cause of your dog’s allergies, just like our own immune systems. When our immune systems mistake a non-threatening substance as a threat it will do its best to protect us. That protection comes in the form of reactions to allergens, usually in the release of histamines in the body. Allergies can cause a variety of reactions, which can sometimes help with detecting the source, but not always. Gastric upset can easily lead you to food allergies, while itching (Pruritis) might make you think of something like fleas. Are Some Breeds More Susceptible to Allergies? You may be asking yourself if allergies are a common problem for your dog’s breed. In reality about 15% of all breeds show some signs of allergies. It can vary according to geographical location, which only shows that many allergens vary according to our environment and seasons. Simply put, allergies are caused by many things and ANY dog can suffer with them. Large or small, active or lazy, old or young…there is a possibility that your dog will suffer with allergies at some point. And, if your dog doesn't suffer from allergies now, he may develop them in you relocate to another region. What are the causes of allergies in dogs? Finding what is causing your dog’s allergies is often a process of elimination. Digestive issues can easily point to food allergies, so changing brands may solve the problem. But, it may take more than one attempt. Checking to see if the offending problem is fleas, and treating your dog and his sleeping areas may clear up the itching. There can still be some time left when Fido can be reacting to histamines brought to the skins surface from an allergy to fleas. Contact allergens seem to be simple to alleviate, just avoid the allergen. It isn’t that simple. Giving your dog baths and wiping down with pet wipes can alleviate some of the symptoms, by removing the contact allergen from the skin, but some allergens like dust are in the environment. When Is Testing for Dog Allergies Required? When basic detective work has not resolved your problem, it may be time to consult your veterinarian, who may suggest allergy tests. 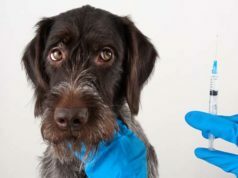 Allergy testing on dogs (PDF) is done much the same way that it is done on humans, and if you have ever had any allergy testing done yourself, you will be surprised to know that the procedure is the same. Different allergens are numbered and injected in small amounts under the skin to determine if there is a reaction and the degree of the reaction. If the reaction is determined to be severe, then your dog has an allergy. The next step is to determine the course of treatment, which may include allergy shots. These shots are done in office, and are made up of low concentrations of the allergen(s). They help your dog’s immune system become desensitized and less likely to react to the allergen. If your dog has multiple allergens, then allergy shots may be the best option. However, you may be able to treat the problem with allergy meds for dogs, depending on the type of allergen your dog is allergic to and how severe the reaction. After determining what is causing your dog’s allergy problems your veterinarian can make several types of recommendations that can include everything from medicated and soothing shampoos to allergy meds for dogs. While allergen shots are often considered the best treatment available, they are often expensive. You may find options that are available without a prescription at your local drugstore, but these medications could do more harm than good. Your veterinarian will explain to you that the way the treatment options work are different as well, and each choice has its own drawbacks. Steroid medications such as prednisone work great, but have side effects and long-term continual use is not generally recommended. Cyclosporine medications like Atopica can have fewer side effects, but causes stomach upset and is far more expensive than other medications and requires a prescription. Any of the prescription medications are more expensive and require trips to the veterinarian which can also increase costs. One less expensive option, are over-the-counter antihistamines like Benadryl, which can help alleviate allover itching. Antihistamines should be used with caution, and followed under the correct dosage for your dog. Your veterinarian can help you with dosage and brands that are available over the counter that would be appropriate for your dog. Benadryl and Claritin are popular choices. Be aware that antihistamines should be used only for a short duration, because long term use is not recommended. Your dog’s allergies can be treated with over-the-counter allergy meds for dogs. You can save money and time by purchasing these medications at your local pharmacy or grocery store. Many can even be found as less expensive generics, but the antihistamines most recommended are usually Benadryl or Claritin. The key to effective treatment with these over-the-counter allergy meds for dogs is to be sure to call your veterinarian and follow their recommendations on brands, types, and dosages. When shopping for your antihistamines it is important to read the labels very carefully, or even ask for assistance in purchasing the correct type of medications. When reading the labels be sure to avoid all medications that contain added decongestants, many of these drugs are additionally labeled with a D.
Decongestants can cause serious and possibly deadly side effects for your dog so taking the extra precautions to follow your veterinarian’s advice to the letter is extremely important. Once you find the right brand and dosage, your dog will find relief from all the itching and start to heal. At the end of the day, love and patience will help you find the answer to what is causing the allergy problems for your dog. It may take some time, and the answer can be easy or complicated. Sticking with good communication with your veterinarian and working with your dog’s immune system, you will find allergy meds for dogs that give your dog relief.